A team at SaTH has been shortlisted for a national award after making financial savings of nearly £2million. 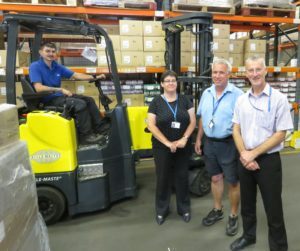 The Procurement team, based at Shrewsbury Business Park, is a finalist in the Financial or Procurement Initiative of the Year category of the Health Service Journal’s Value Awards 2019, which recognise excellent use of resources and also seek out examples of demonstrable improvement in outcomes. They have been nominated for their ‘Lean Methodology Journey’ – which saw them making savings of £1.8million in the 2017/18 financial year. The overall winner will be announced in May. The savings were achieved by using ‘lean methodology’ from the Trust’s Transforming Care Production System – created as part of the partnership with the Virginia Mason Institute in Seattle, the USA’s Hospital of the Decade. The team introduced new and improved methods of working, which has helped them to remove unnecessary jobs and reduce the value of stock held in store rooms, all of which has significantly cut down on wastage and transport costs. The products that the Trust orders for its hospitals are also now in a catalogue meaning far fewer mistakes, and enabling clinicians to spend more time with patients instead of ordering stock for their wards and departments. Paula Davies, Head of Procurement at SaTH, said: “To be recognised in this way for the work we have done is absolutely fantastic. Simon Wright, Chief Executive at SaTH, said: “Paula and her team have made a considerable difference to our organisation and I am very proud of all their hard work.